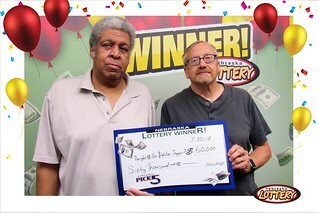 Walter Joyner and Dwight Miller of Papillion won $60,000 playing Nebraska Pick 5 from the Nebraska Lottery. Joyner purchased the winning ticket from Hy-Vee Gas at 7608 Olson Drive in Papillion. The quick pick ticket contained five plays with one containing the winning numbers (07, 13, 22, 25, 35) from the July 28 drawing that. Joyner and Miller have been pooling their money on Lotto tickets for about a year and a half, but they’ve been friends since they met while in the Air Force in 1981. The win came as a huge surprise, Joyner said when the pair claimed their prize on July 30. He was checking the ticket he’d marked with their initials “W/D” on the Nebraska Lottery website and said they’d won a few dollars on Nebraska Pick 3 as well before looking at the Pick 5 numbers. Miller said he’ll be using his share of the winnings to pay off his truck, and Joyner said he’s just going to enjoy looking at his bank statement for a while. Even though they just won big, the two said they’ll keep buying Lotto tickets. “We like to dream,” Joyner said. Nebraska Pick 5 is Nebraska’s unique Lottery game: all the proceeds from Nebraska Pick 5 stay in Nebraska, and all the winning tickets are sold in Nebraska at Nebraska Lottery Lotto game retailers. The odds of winning the Nebraska Pick 5 jackpot, which starts at $50,000 and grows by $4,000 each drawing that is not won, are 1 in 501,942 while the overall odds of winning a prize in the game, which has drawings seven nights a week, are 1 in 8. Through July, the Nebraska Pick 5 jackpot grows by $10,000 every drawing it’s not won.